Allowances can be made for the low level of possessions given the conditions that afflicted this game. With that in mind Justin McNulty will be happy with his team’s body of work in Tullamore. When Laois had the wind in the first half they built a good lead with Strong, Munnelly & Quigley all landing points from outside the 45m line. A note of caution however has to be struck. Yes this was a very good win for them however it is unlikely that they will have a Shot Rate of 88% again this Summer. Given that a Success Rate on their shooting of just about average will probably not suffice against the better teams. The positive Expected Return on their shooting can probably all be attributed to the three points from outside the 45m line – their shooting outside that was average. If, as we expect, they don’t maintain the very high shot rate they will have to be more accurate with their shooting. Laois are more physical than in previous years however they will need to get their tackling under control against Dublin. Laois only coughed up 4 scores from play however they offered up 11 shots from frees (Sheridan’s deadball was a 45). If their tackling is not more disciplined (or de we say it cynical so that they don’t foul in scoring range) then they will be in trouble against Dublin. Although we have seen the Dublin forwards take a collective day off previously – vs. Wexford – it is hard to see them only scoring 4 times from play. Laois cannot afford to give away 9 points from deadballs again this Summer. In the Dublin-Meath game I commented on how only getting 17 shots from play was poor for a forward line with the talent of Meath. This game was no better. Whilst the traditionalists laud Meath for their long ball approach it is plainly not working for them at present. In two games they have gotten less shots off than average and their Success Rate on the shots they did get off was poor as well. If Banty survives into 2013 they will need to review their gameplan. I was surprised at the relatively good returns produced by this game. The game appeared to have a bit of an uncontrolled edge to it – lots of misplaced balls, simple passes going astray etc. ; the returns, showing just about average Shot Rates and above average Success Rates, would appear to give an indication of controlled accuracy. Part of the answer to this dichotomy comes in the below average number of possessions. You would expect the relatively open nature of the game (contrast to Kerry V Tyrone) to produce a higher number of possessions. 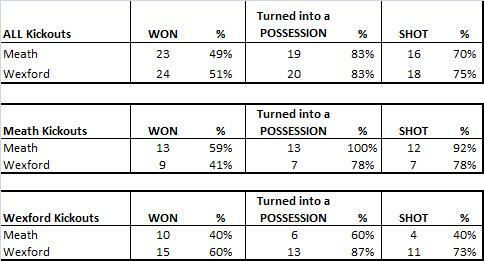 The relative lack of possessions shows the sloppiness that afflicted the game at times – neither team could make the ball stick up front often enough. Long direct balls were being intercepted, or punched away, on a frequent basis ensuring that the forwards didn’t get (enough) clean possession. When the ball did stick both teams used it effectively. It was the very end product – the shooting – that had a semblance of controlled accuracy. They are essentially average. Now with Bernard Brogan in the form he has shown in the Louth & Meath games this may well suffice. If the Wexford version of Bernard Brogan shows up – or even an average version – then Dublin will struggle against better teams. Kevin McManamon is the one most likely to step up but Dublin supporters will be hoping that Sunday was an aberration. If McManamon is only taking two shots a game then the burden on Brogan will only intensify. What of Meath? It’s very hard to determine anything concrete from the numbers. The fact that they were so far down for most of the game,and thus went for goal (4 shots, 1 goal) where others would have popped a point, definitely hurt their returns however they had a more fundamental problem in actually getting enough shots off. They only had 17 shots from play (average is 21). Dublin did foul a bit more than average when they got the ball inside however with natural strikers of the ball like Farrell, Sheridan & Reilly you would want more than 17 shots from play.